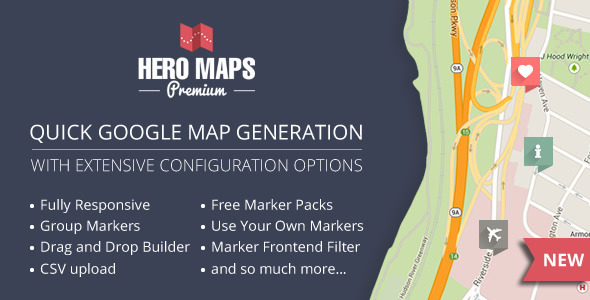 The Hero Maps Premium plugin allows for quick and easy Google Maps addition to your WordPress website. It offers extensive configuration options, the ability to aggregate all your markers in one map via Marker Geo Mashup, and provides a simple drag-and-drop interface for marker generation. Our easy to use backend will allow you to switch between a full width or a fixed size, all depending on your design preference. We have included 3 marker packs available in many colors. More marker packs will be available soon. Upload and use your own markers if you feel you need more flexibility. Will resize dynamically on any screen. We give you the ability to set up fixed size or full width maps and the ability to set it to responsive. Categorize markers into groups and filter the output on the map. Lines and shapes can be drawn with the greatest of ease on any map. Will resize dynamically on any screen. Export your map and markers and import into another site. The default Google skin is standard, but many map skins are included to give you more design flexibility. HeroMaps Premium supports the ability to import CSV files that contain the details of a list of markers to your maps. The ability to get directions from your current location to any location marker on the map. Clustering simplifies your data visualization by consolidating data that are nearby each other on the map in an aggregate form.